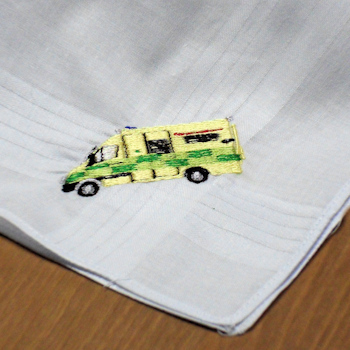 Unique embroidered ambulance motif handkerchief that can also be personalised with a single name or initials. Select from one single hanky or a gift set of 3 handkerchiefs. Just fill in the option box with a name or initials and choose what colour embroidery thread you would like for the text and the letter font style. Just fill in the option box with a name or initials and choose what colour embroidery thread you would like for the text and the letter font style. The NHS Ambulance motif is sewn in colours to resemble the British vehicle. Please allow at least 48 hours for personalised orders to be dispatched as they are customised to order by Amys Gifts.